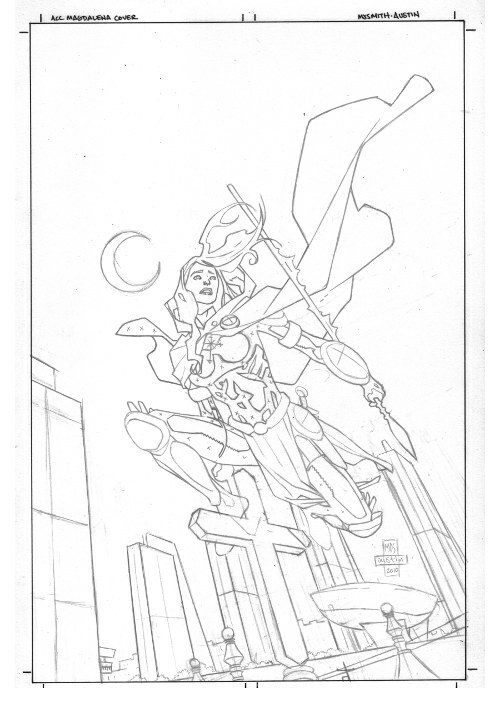 Last time, I showed off Matthew Dow Smith’s roughs for the upcoming Albany Comic Con variant cover of Magdalena #1 (with Matt’s kind permission, I might add). As you see now, the consensus pick was the “perched on a cross” image, as it allowed for a large, striking figure of Magdalena, and utilized the Albany skyline in the background. 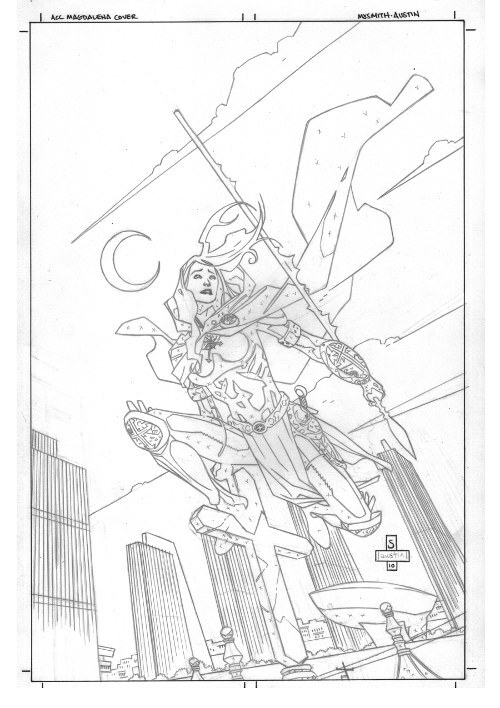 Once the selection was made, Matt revised the image into a more refined rough (above), adjusting the pose and adding the Spear of Destiny in her hand. That completed and approved, Matt moved on to the actual pencils on a full size board, “full size” for comic originals being roughly 11 inches by 17 inches. 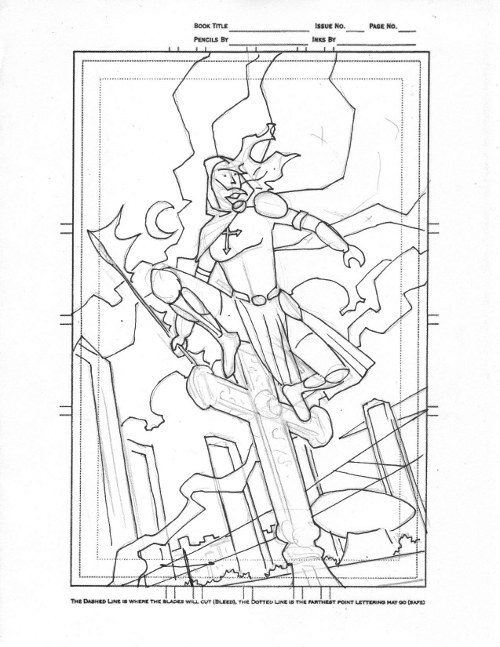 The second image shows Matt’s rough pencils, more of a work in progress. Magdalena’s pose was revised again, albeit slightly, and the Spear switched hands. The perspective for the background was also worked out, arranging the towers and uniquely-shaped Egg performing arts center. After a quick approval, Matt completed the finished pencils, adding detail to Magdalena’s ornate costume as well as the towers. A final note from Top Cow’s Filip Sablik asked for the Spear to be a little longer, and for Magdalena’s face to be given a slightly more delicate look. Once those revisions were made, the pencils were complete and ready to go to inker Terry Austin. Since Terry lives only an hour away, I met Matt for coffee, got the cover from him, and delivered it to Terry. 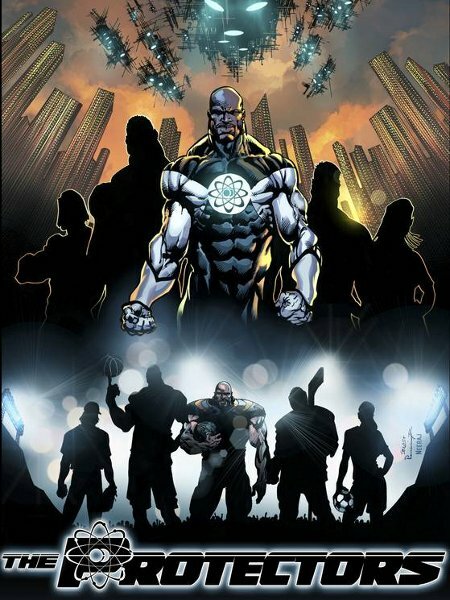 Since Terry had never inked Matt before, the cover was virgin territory for both of them. I know I was really anxious to see what the collaboration would look like. Next time, I’ll show you how it turned out.